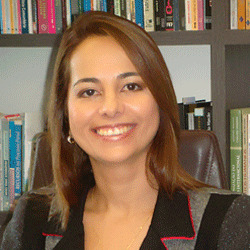 GRECIANNY CARVALHO CORDEIRO is prosecutor criminal em Fortaleza city, state of Ceará-Brazil. Master in Constitucional Right for the two universities: UNIVERSIDADE FEDERAL DO CEARÁ - UFC and UNIVERSIDADE DE FORTALEZA - UNIFOR. Newspaper columnist, to the JORNAL O ESTADO. Wrote juridical books: PENAS ALTERNATIVAS: UMA ABRODAGEM PRÁTICA (Alternative Sentences) and PRIVATIZAÇÃO DO SISTEMA PRISIONAL BRASILEIRO (Privatization of prisons). Wrote the fictions: ANJO CAÍDO (FALLEN ANGEL), TROIA - UMA VIAGEM NO TEMPO (TROY - A TRIP THROUGH THE TIME), MARCAS DA INOCÊNCIA (Vestiges of Innocence)(historical fiction and drama in USA and Berlin, in the 60ths and 70ths) and the book of poems: POEMAS A QUATRO MÃOS (POEMS IN FOUR HANDS). Participations in many Antologies: in Geneva, Paris and Turin. Member of the Academy of Letters: ACADEMIA METROPOLITANA DE LETRAS DE FORTALEZA- AMLEF and the UNIÃO BRASILEIRA DE ESCRITORES DO RIO DE JANEIRO.